The Honda ATC Brochure site! These Brochures are brought to you by the 3WheelerWorld.com , 3 Wheeler World Forums websites, and the generous users that have donated info and / or money to keep the site going. We would also like to give a BIG THANKS to Eric Russell for all the hard work he had done to compile most of these brochures and ad's. He no longer hard the time to keep his site up, so he sold the info to 3WheelerWorld so that his hard work will remain available for viewing by the internet users. Thanks Eric!!! We have listed the brochures by year and listed the ads with thumbnails. 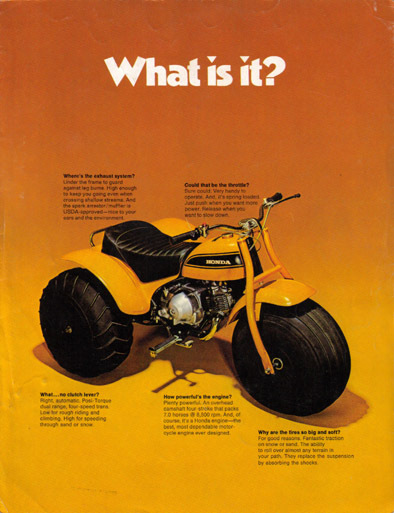 Please check out the best three wheeler site ever!